Liverpool Pembroke Sefton women had another great weekend. At the Cardiff Cross Challenge Rosie Johnson represented the North in an inter-Area match. Her controlled running helped her capture fifth place in a strong field. 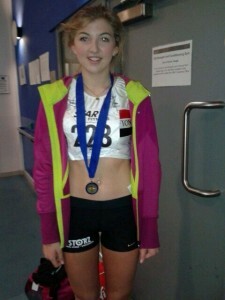 She was first in for the North, a particularly impressive performance as most of the field were in a higher age group. This will greatly boost her confidence as she goes to the Northern Championships at Knowsley Safari Park this coming weekend. In a somewhat different setting, the Northern Indoor Championships at Sheffield, Amelia McLaughlin received a similar confidence-booster in the Under 20 High Jump as she recorded an excellent 1.74m to take the title. Having recovered from a broken wrist she is clearly back in good shape and will be looking to beat the elusive 1.80m barrier in the next few months. Her next competition is in late February. Kirsty Longley was late for a training session at Skelmersdale`s Beacon Park but took advantage of the Ashurst Beacon Race that was about to start nearby. Running a completely controlled race she was still too good for the female opposition and recorded an easy win. Graham Cairns and Chris Pedder took first and second in the Men`s Over 55 race. Robbie Wood, John Halson and John Dobie also competed in a Vet`s day out. Back in the Sheffield Arena there was a raft of good male performances but frustratingly several just outside the medals. At U20 Sean Bosman in his first major indoor competition ran a 53.40 for 400m in fifth spot. In the senior event an LPS quartet of Nathan Hilton(49.06), Adam Thomson(50.29), Wayne Ashall(52.32) and Danny Higham(49.89) all posted useful heat times but only Nathan made it to the Final with an agonisingly close 4th placing in 49.57. The club`s Under 17 rising stars Morgan Greaves-Thomas(7.42 for 60m) and Joe Milton(200m in 23.54) both finalised in 5th and 4th respectively. Harry Doran opted for the Senior 800m where he has enjoyed success before. His heat time of 1.56.70 looked promising but he faded to 2.01.69 in the Final and a disappointing sixth.